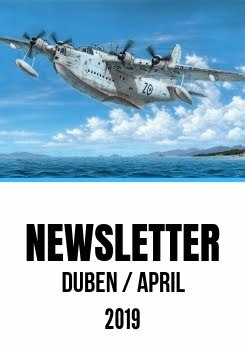 The new Hi-Tech kit of the Tempest Mk.V model has already been announced here in one of the earlier instalments of Special Hobby blog. 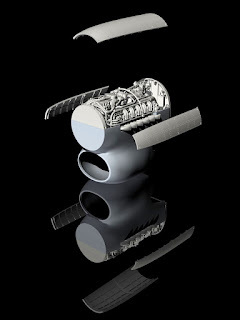 This model is to contain also a partial replica of its Napier Sabre power unit and now we have brought a computer rendered image of this detail in a picture below. Here is also a detailed description of the camouflage options of this kit. Hawker Tempest Mk.V SN222/JF-E "Le Grand Charles", No.3 squadron, Fassberg base (B.152),late April / early May 1945. The machine bearing the name "Le Grand Charles" was one of the last Tempest aeroplanes which were flown by the French WW2 top ace F/Lt Pierre "Cloclo"Clostermann. Hawker Tempest Mk.V EJ750/JBW, No.122 Wing, Wg Cdr J.B. Wray´s personal mount, Volkel (B.80), late 1944. At the controls of this machine, J.B. Wray achieved one aerial victory over a Me 262 and another one claimed as damaged. Hawker Tempest Mk.V EJ762/JJ-F, No.274 Squadron, F/L D. C. Fairbainks DFC and Two Bars (12,5 victories), Volkel (B.80), October 1944. On 19th October 1944 during an aerial combat, the machine received a hit into its port wing fuel tank and the petrol set ablaze and burned off the left tail plane paint and damaged its fabric skinning. Despite all this, F/L D.C. Fairbanks got its wounded mount safely back. Hawker Tempest Mk.V SN206/5R-B, No.33 Squadron, F/O G.A. Rens, Quackenbrück (B.109), May 1945. In early May, G.A.Rens, a Belgian pilot flying in the ranks of No.33 Sqn took part in two dive bombing raids. The role of a dive bomber was quite exceptional for the Tempest fighter and unique only to this unit. Hawker Tempest Mk.V SN330/J5-H, No.3 Squadron, Sqn/Ldr Robert Bruce Cole, DFC and Bar, Wunstorf, British Occupation Zone, Germany, 1946. 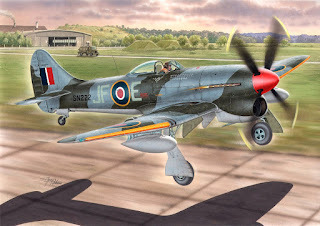 During the Second World War, R.B.Cole gained one confirmed victory, one probable and another 5 ½ damaged enemy aircraft. He added also one e/a damaged on the ground and number of military vehicles and trains. On 16th January 1956, Cole was killed whilst flying a Canberra aircraft in a rank of Wing Commander. His Tempest SN330 was painted silver colour overall and fitted with rocket projectile launchers. My favourite aircraft and one that you have done justice to at long last. Very well done. I already have three of the previous hi-tech version and I certainly intend to do the same with this latest release.